Gene Probes for Bacteria focuses on the preparation and use of nucleic acid probes for identifying bacteria in clinical specimens and in other samples of practical or scientific interest. Organized into 17 chapters, this book addresses which nucleic acid probes are available; how and when to utilize them; what to expect in terms of results obtained with their use; and how to prepare probes. 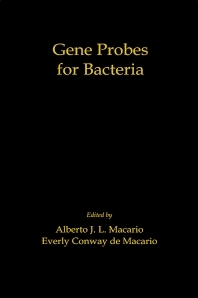 Each chapter is composed of comprehensive manuscript covering different microorganisms. A few bacterial species are treated in more than one chapter to provide a multidimensional picture of important microbes, and to compile the knowledge gained from different laboratories using the same or different probes or methods. This reference material will be of great use to professionals, technicians, and R&D directors in universities, federal and state-dependent service and research institutes, and private and industrial laboratories.